The vast majority of philippinites are highly oriented. Small and medium-sized shield cores are predominantly lenticular and are locally referred to as ‘biscuits’ (see Figure 10.29). Larger oriented bodies formed bifurcated cores (see Figure 10.30), which are locally referred to as ‘hamburgers’. It is notable that globular cores (see Figure 10.31) and globular bifurcated cores (see Figure 10.32) are also present in the assemblage. In fact, one can observe a full sequence between lenticular to globular to spherical morphologies. Spherical forms could not gain an orientation and are discussed in the next section on un-oriented bodies. FIGURE 10.29: A 62.0 gram (44x43.5x27.5 mm) shield core from Paracale Municipality, Camarines Norte, Bicol Region, Philippines. Left: Posterior view, Middle: Side view, Right: Anterior view. (Catalogue # PB1115726). Medial Philippine tektites are unique in that, whilst most bodies are oriented cores, many are un-oriented spheres. Un-oriented bodies indicate the pre-re-entry shape was spherical - contrary to popular belief this is highly unusual as it indicates the body formed in space with little or no atmospheric interaction. Philippintes must have been ejected at an optimal speed and inclination in order to achieve this. FIGURE 10.30: A 247.1 gram (65x63.5x49 mm) bifurcated ‘hamburger’ core from Paracale Municipality, Camarines Norte, Bicol Region, Philippines. Top Left: Posterior view, Top Right: Anterior view, Bottom Middle: Side view. (Catalogue # PB1115027). FIGURE 10.31: A 48.8 gram (36x35x32 mm) globular core from Paracale Municipality, Camarines Norte, Bicol Region, Philippines. Left: Posterior view, Middle: Side view, Right: Anterior view. (Catalogue # PB1115687). Historically, the author assumed that philippinites were derived from spherical primary re-entry bodies, as had been interpreted in for australites over the past 75 years. On attempting to measure the sphericity of the posterior surface of philippinite cores a problem was encountered. It became apparent that the bodies were not spherical, the curvature of the bodies increased towards the margins. Initially this was interpreted as due to abrasion on the edges of water-worn Bicol specimens. Further measurement of 'fresh' barely abraded or etched specimens, however, indicated that the increase in curvature at the margins was genuine: Oriented philippinites were not derived from spheroidal bodies. This realisation led to a significant breakthrough in terms of understanding philippinite formation. If philippinites had been derived from a spherical body then an explanation was required as to why often 70-90% of the body had apparently spalled. This necessitated spallation in response to re-entry heating, something not observed in distal australites. Spallation in australites very clearly came after the ablation / heating event. Originally it was suggested that the lower re-entry velocity of philippinites may have allowed greater heat-transfer to the specimen resulting in spallation in response to heating as oppose cooling. Now, with the understanding that in actuality only a thin shell had been lost from the anterior of a plastically deformed philippinite body a better explanation could be proposed that conformed to observations in distal tektites. It is therefore theorised that, during the ejection phase, philippinite primary spheres were plastically deformed and flattened to varying degrees. This gave them a fixed re-entry orientation. During the initial re-entry phase the medial tektites were likely protected to some degree by a boundary layer between the tektite and the shock wave. Nonetheless, the anterior surface of the tektite was heated up, but insufficiently for melting to occur and probably sufficiently gradually to avoid spallation. Once much of the inherited cosmic velocity was lost, so was the shock wave and boundary layer. Rapid cooling ensued, which resulted in spallation of the anterior surface. Evidence of spallation and brittle failure of the glass is found on the anterior of medial oriented tektites. Polygonal cracks or, on smaller bodies, radial cracks on the anterior margins developed as triangular or polygonal shell segments were lost. Radial cracks represent imperfect polygons as the cracks do not meet. The anterior surface of the shield ‘biscuit’ cores, which formed from small and medium-sized primary bodies, also exhibit evenly spaced circular navels (see Figures 10.1 and 10.2), which represent Hertzian cones. These navels were discussed in detail at the beginning of this chapter. The presence of navels / Hertzian cones demonstrates that spallation took place during flight, whilst the tektite was still under relatively high deceleration pressures. The variability of philippinite cores (see Figure 10.33) can therefore be attributed to two factors. 1) The degree of plastic deformation during the ejection phase. 2) The temperature of the body during re-entry (the retention of heat is largely size-related). Moderately plastically deformed bodies result in typical shield cores and bifurcated cores. Bodies disrupted at greater altitude during the ejection phase resulted in less plastically deformed globular cores and globular bifurcated cores. Bodies disrupted above atmospheric effects remained spherical, suffering no plastic deformation, and went on to form un-oriented re-entry bodies. The large-sized bifurcated and globular bifurcated cores were of sufficient size to retain a hot, even possibly molten interior during re-entry, as insufficient time had past for large bodies to cool. These bodies were evidently cool enough on the exterior to resist plastic deformation during re-entry, but hot enough to resist the formation of Hertzian cones. The absence of navels / Hertzian cones on the anterior of bifurcated cores likely indicates shell loss occured at a later stage, when much lower external pressures were present, maybe even after hitting the ground. FIGURE 10.33: Philippinite cores form from plastically deformed bodies, which are necessarily oriented. They are heated during re-entry and subsequently rapidly cooled once inherited cosmic velocity is lost, resulting in spallation. Cores from the largest of bodies are typically bifurcated. Cores from smaller bodies are typically lenticular. Cores may be globular to lenticular in shape, depending on the degree of plastic deformation in the ejection phase. Dashed line represents plastically deformed shape at re-entry point. U-grooves are chemically enhanced cracks. 1 A bifurcated core (see Figure 10.30), locally known as a ‘hamburger’. These form from large plastically deformed bodies. The interior was still hot during re-entry and hence u-grooving is poorly developed on the anterior surface and navels are almost non-existent. 2 A bifurcated core, typically over 60 mm in diameter. 3 A lenticular-shaped shield core (see Figure 10.29), locally known as a ‘biscuit’. These form from small and medium-sized plastically deformed bodies. U-grooves and navels are typical of the anterior surface. 4 Lenticular-shaped shield cores attain a maximum diameter of around 65 mm, but are typically 30-40 mm in diameter. 5 Globular bifurcated core (see Figure 10.32). Some large philippinites suffered minimal plastic deformation during the ejection phase and therefore retained a more spherical shape. 6 Globular cores (see Figure 10.31) result from small-medium sized bodies that suffered less plastic deformation during the ejection phase. 7 A few philippinites underwent greater plastic deformation than average during the ejection phase. This resulted in a ‘flatter’ shield core with a lenticular shape. 8 Shell fragments represent the material spalled from cores. Unlike proximal and distal settings, in which almost all tektites are oriented, the medial tektites are occasionally un-oriented. There appears to be a continuous sequence from oriented lenticular-shaped shield cores to oriented globular cores to un-oriented spheres. The presence of un-oriented forms strongly suggests a high altitude of formation, above significant atmospheric effects. These medial un-oriented tektites tumbled during re-entry. The effect of a tumbling or rotating fall is to distribute the re-entry heat evenly over the entire body. This significantly reduces subsequent spallation. In order for a specimen to be un-oriented it must effectively be a perfect primary sphere prior to re-entry. Specimens that are primary prolate spheroids may also be partially un-oriented, rotating about the roll (long) axis rather than tumbling totally randomly. Following re-entry, un-oriented tektites remain broadly spherical in shape. The smallest, typically under 150 grams, exhibit meandering u-grooves, which are etched cracks formed as the tektite was cooled rapidly following re-entry heating. These bodies are known as small grooved spheres (see Figure 10.34). As the tektite spheres become larger to typically 65 mm diameter or up to around 350 grams the u-grooves form a polygonal set of cracks over the entire body. These bodies are termed ‘breadcrust’ tektites (see Figure 10.35). As the size of the tektite sphere increases further the u-grooves become less prominent. Over 75 mm diameter, or roughly 500 grams, the spheres are usually smooth (see Figure 10.36). FIGURE 10.34: A 51.04 gram (35x35x34 mm) small grooved sphere from Paracale Municipality, Camarines Norte, Bicol Region, Philippines. (Catalogue # PB1113762). FIGURE 10.35: A 211.2 gram (64 mm diameter) breadcrust sphere from Masbate, Philippines. U-grooves have been etched into the specimen. (Catalogue # PM1116914). Some people have considered large smooth spheres to be the end product of spallation. However, 'indicator' forms (large smooth spheres with partial shell still attached) have never been found. Large spheres are in fact smooth, not due to spallation, but due to lack of spallation: A lack of brittle failure as, due to their size, they remained hot enough during re-entry to avoid brittle failure. FIGURE 10.36: A 745 gram (89x84x78 mm) smooth philippinite sphere from Paracale, Bicol Region, Philippines. (Catalogue # PB1114354). The difference in surface sculpture with size of the sphere is attributed to the temperature of the body. With a flight time estimated at 7-10 minutes, only the small and medium-sized specimens could cool sufficiently throughout to behave in a brittle manner. Large spheres clearly retained a hot interior and whilst the exterior surface was sufficiently cool to resist plastic deformation during re-entry, it is interpreted that the body remained sufficiently hot to resist the re-entry cracking. It is clear from indochinites, which do not have comparable cracks, that simply cooling from the outside-in does not produce polygonal contraction cracks. The specimen must cool sufficiently to become brittle, be re-heated by ram pressure re-entry heating such that the exterior is now hotter than the interior and then the exterior surface is rapidly cooled by the air flow once the inherited cosmic velocity is lost. It is suggested that at this point the glass contracts and cracks under tension. In larger bodies the exterior is being heated by radiation from the hot interior and this likely prevents formation of tensile cracks. The very largest spheres, in excess of 10 cm diameter, are expected to fragment when they cool and pyramidal/conical, sometimes L-shaped, sphere fragments result (see Figure 10.37). These specimens likely fragmented on the ground because whilst they were in flight they probably remained too hot for brittle failure to take place. FIGURE 10.37: Naturally fragmented philippinite spheres from Paracale, Bicol Region, Philippines. Top left: 78.7 gram (50x40.5x35 mm) philippinite fragment (Catalogue # PB1111324), Middle left: 42.2 gram (45x27.5x28 mm) philippinite fragment (Catalogue # PB1111891), Bottom left: 42.5 gram (58x22.5x33 mm) philippinite fragment (Catalogue # PB1111741), Centre: 202.3 gram (93x40x40 mm) philippinite fragment (Catalogue # PB1111757), Top right: 86.4 gram (59x45x29 mm) philippinite fragment (Catalogue # PB1111925), Middle right: 51.5 gram (55x25.5x30.5 mm) philippinite fragment (Catalogue # PB1111717), Bottom right: 31.9 gram (35x30x25.5 mm) philippinite fragment (Catalogue # PB1112109). Some initially un-oriented forms appear to have established a late-stage orientation, resulting in variable amounts of anterior spalling to create indicator specimens. In the case of breadcrust indicators (see Figure 10.38) we can be sure that they were originally un-oriented due to the polygonal cracking on the now posterior surface. 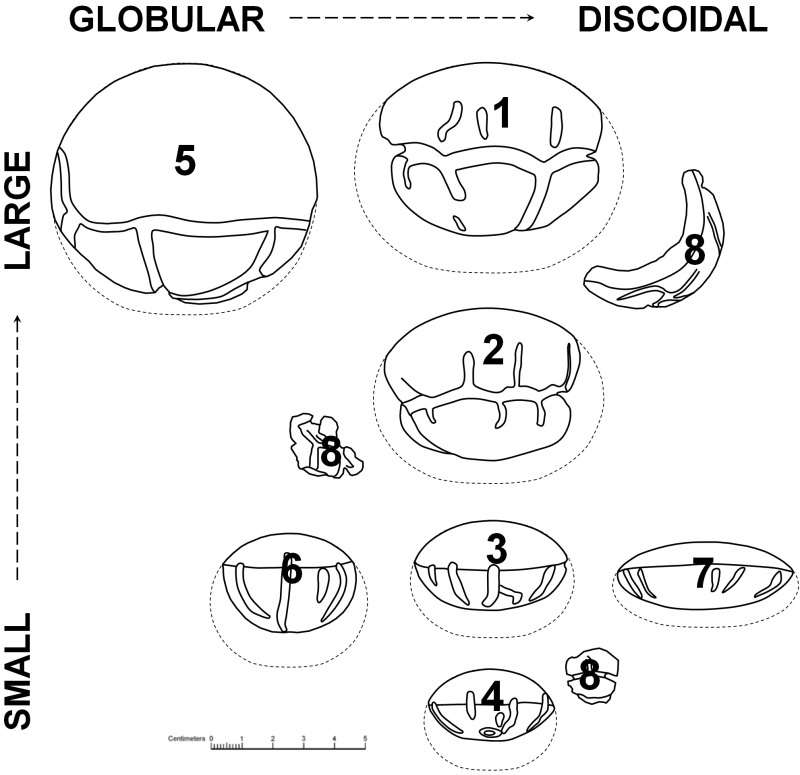 In the case of larger bodies, which can be catagorised as transitional smooth spheres (grading to globular bifurcated cores), it is less certain whether they were originally un-oriented, but the retention of most or all of the shell would suggest it is the case. FIGURE 10.38: A 166.1 gram (57x57x48 mm) breadcrust indicator from Paracale Municipality, Camarines Norte, Bicol Region, Philippines. Top left: Posterior view. Top right: Anterior view showing spallation. Bottom middle: Side view. (Catalogue # PB1113716). FIGURE 10.39: A 352.0 gram (69x65x61 mm) transitional smooth sphere from Paracale Municipality, Camarines Norte, Bicol Region, Philippines. Top left: Posterior view. Top right: Anterior view. Bottom Middle: Side view. (Catalogue # PB1113777). It is noteworthy that some very large shell fragments are known. The author used to consider these as evidence that even the largest philippinites developed a breadcrust shell, which was subsequently lost due to the thermal instabilities of larger bodies. The absence of indicator forms that retained part of the shell was problematic. It is now considered that these very large breadcrusted shell fragments are either anterior shell fragments or are atypical in their cooling history, i.e. they cooled faster than other large bodies. The reason for this is likely that they are not true shell fragments, but fragments of large bodies that contained very large bubbles. Early fragmentation may also have aided cooling, although the role of fragmentation is uncertain. The variability of un-oriented philippinite spheres (see Figure 10.40) can be attributed to two factors. 1) The temperature of the body during re-entry (the retention of heat is largely size-related). 2) The gaining of a late-stage orientation. Large-sized bodies retained heat from the time of formation. During re-entry they evidently had a solidified exterior capable of resisting plastic deformation. The hot interior heated the body and prevented brittle failure of the exterior. Smaller bodies had cooled sufficiently to allow brittle fracturing of the surface due to late-stage re-entry cooling. If a shell fragment was lost then the sphere would develop a late-stage orientation. This appears to be commonplace, resulting in an imperfect breadcrust sphere where material was spalled from a newly established anterior surface. FIGURE 10.40: The surface sculpture of un-oriented philippinites is size-dependent. Some un-oriented bodies appear to have gained a late-stage orientation. Note that u-grooves are chemically enhanced cracks. Perfect spheres formed above atmospheric effects and therefore did not undergo plastic deformation during the ejection phase. 1 The very largest spheres typically fragmented, probably shortly after reaching the ground, due to tensile stresses developed during cooling. It is very rare to find a sphere in excess of 100 mm in diameter. 2 Perfectly smooth spheres occur in bodies over around 75 mm in diameter. During re-entry the exterior was sufficiently cooled to resist plastic deformation, but the interior was sufficiently hot and radiating heat, to prevent brittle crack formation on the exterior of the tektite. 3 As the size of the sphere decreases some crack formation may be evident. These specimens are known as transitional smooth spheres. 4 Under 75 mm diameter and typically around 60 mm diameter breadcrust spheres develop. These bodies exhibit polygonal u-grooves over the entire surface. The u-groove is formed due to chemical enhancement of a paper-thin crack. The cracks indicate that the interior of the tektite had cooled by the time the entire exterior surface was exposed to re-entry heating as the specimen tumbled in its trajectory. 5 The smallest breadcrust spheres are around 45 mm in diameter. 6 Small grooved spheres form in exactly the same way as breadcrust spheres. U-grooves are chemically enhanced cracks. On smaller bodies u-grooves may become meandering as the body is of insufficient size for perfect polygons to form. 7 Small grooved spheres are usually around 50 mm and below, with the boundary between breadcrust spheres and grooved spheres being gradational. If an un-oriented body spalls due to thermal shock a late-stage orientation will be established. 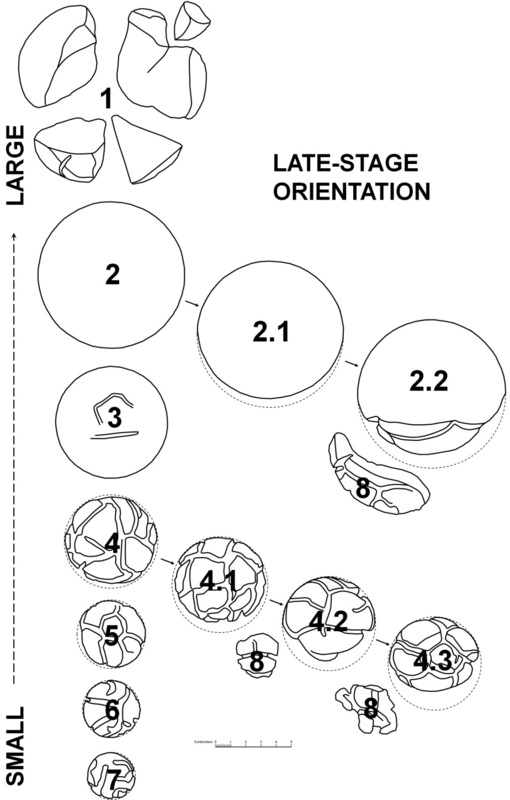 8 Shell fragments represent material spalled from late-stage oriented bodies. 2.1 Spherical morphologies are often slightly off-spherical. This is likely due to spallation of a thin layer of material once a stable orientation is established. Spallation of these large medial bodies is likely analogous to bald spot formation in indochinites. A stable orientation may be established due to pre-existing plastic deformation (although this should lead to formation of a globular bifurcated core) or due to a later stage spallation event that results in an imperfect sphere. 2.2 There is a continual gradation from a spherical body to a globular bifurcated core. A body such as this likely formed from a slightly plastically deformed body, but a late-stage orientation due to a spallation event cannot be ruled out. 4.1 Breadcrust tektites show very clear evidence of late-stage orientation. Due to the interior cooling prior to re-entry, the tumbling tektite develops polygonal cracks over the entire surface due to the re-entry heated surface being rapidly cooled. Surfaces not exposed to re-entry heating do not develop these cracks, hence we can be sure these specimens tumbled. Once a spallation event occurs a fixed orientation is established, resulting in further spallation on the newly developed anterior surface. 4.2 A late-stage oriented breadcrust specimen. 4.3 A late-stage oriented breadcrust specimen. We can be certain that the specimen initially tumbled due to the cracking on the posterior surface. A tektite re-entering the Earth’s atmosphere will always ‘try’ to seek a stable orientation. Any imperfection in the tektite or any shell loss will result in a stable orientation being established. Elongate tektites such as broad ovals, narrow ovals and symmetrical dumbbells, but not teardrops or asymmetrical dumbbells, may acquire a stable rotational orientation if they are spheroidal in section (i.e. they were not plastically deformed). This is where the body rotates about one axis, presenting a rotating blunt surface to the direction of travel. The likelihood of rotationally oriented bodies forming is enhanced by smaller sized tektites that are more thermodynamically stable. These tektites are much less likely to suffer a spalling event which would inevitably then result in a stable orientation being established. Figure 10.41: Rotationally oriented bodies rotate about the long axis. Cracks are terrestrially etched to form U-grooves.